Frank Frederick Borman II (born March 14, 1928), (Col, USAF, Ret. ), is a retired United States Air Force pilot, aeronautical engineer, test pilot, and NASA astronaut, and the Commander of Apollo 8, the first mission to fly around the Moon, together with crew mates Jim Lovell and Bill Anders, the first of 24 humans to do so. Before flying on Apollo, he set a fourteen-day spaceflight endurance record on Gemini 7, and served on the NASA review board which investigated the Apollo 1 fire. After leaving NASA, he was the Chief Executive Officer (CEO) of Eastern Air Lines from 1975 to 1986. Borman is a recipient of the Congressional Space Medal of Honor. As of 2019[update], he is the oldest living former American astronaut, eleven days older than Lovell. Borman was born on March 14, 1928, at 2162 West 11th Avenue in Gary, Indiana. A nearby stretch of Interstate 94 has been named the Frank Borman Expressway after him. He is of German descent, born as the only child to parents Edwin and Marjorie Pearce Borman. Because he suffered from numerous sinus problems in the cold and damp weather, his father packed up the family and moved to the better climate of Tucson, Arizona, which Borman considers his home town. He started to fly at the age of 15. Borman graduated from Tucson High School in 1946. He received a Bachelor of Science degree from the United States Military Academy at West Point, in 1950, where he served as an Army Football Manager, and along with part of his graduating class, he entered the United States Air Force (USAF) and became a fighter pilot. He received his Master of Science degree in Aeronautical Engineering from the California Institute of Technology in 1957. Later, Borman was selected for the Aerospace Research Pilot School (Class 60C, I) and became a test pilot. He attended the six-week Harvard Business School's Advanced Management Program in 1970. Following graduation, Borman was a career U.S. Air Force officer. Prior to joining the National Aeronautics and Space Administration's space program in 1962, he received his pilot wings in 1951 and served as a fighter pilot with the 44th Fighter Bomber Squadron in the Philippine Islands from 1951 to 1953, and as an operational pilot and flight instructor in various squadrons in the United States, from 1953 until 1956. Most of his flying was on F-80s, F-84s, swept wing F-84Fs and T-33s. Borman was then reassigned to his LM test mission, now planned to fly as "Apollo 9" in early 1969 after a first, low Earth orbit LM flight commanded by McDivitt in December 1968. But the LM was not ready for its first flight, leading NASA management to decide to replace Borman's mission with a lunar orbit flight using just the Command/Service Module as Apollo 8 in December, making McDivitt's flight Apollo 9 in March 1969. Borman's Lunar Module Pilot (and spacecraft systems engineer) was William Anders. 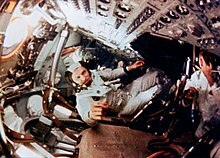 The Command Module Pilot and navigator, Michael Collins, had to have back surgery and was replaced by his backup, James Lovell, reuniting Borman with his Gemini 7 crewmate. Apollo 8 went into lunar orbit on December 24 and made ten orbits of the Moon in 20 hours before returning to Earth. And, from the crew of Apollo 8, we close with good night, good luck, a Merry Christmas, and God bless all of you—all of you on the good Earth. After Borman became Eastern's CEO, the company went through the four most profitable years in the company's history. However, Eastern would struggle in the 1980s due to high debt loads caused by Borman's decision to twice borrow money to purchase new aircraft. A cost savings agreement proposed by Eastern's unions would bring the airline back to profitability in the early 1980s. However, in 1983, contentious battles with labor unions, particularly the International Association of Machinists and Aerospace Workers (IAM) led to union calls for Borman's removal as CEO before the unions would agree to any changes in union contracts. In response, Eastern's board decided to sell the airline to Texas Air Corporation, headed by Frank Lorenzo. Borman retired from Eastern in June 1986. Borman married Susan Bugbee in 1950, and they have two sons: Frederick and Edwin, and four grandchildren. Upon retirement, Borman and his wife, moved to Las Cruces, New Mexico, where he enjoyed rebuilding and flying vintage airplanes from the World War II and Korean War era. For a time, he was the majority owner of a Las Cruces Ford dealership founded by his son, Fred. Borman purchased a cattle ranch in the Bighorn Mountains of southern Montana in 1998, where he and his wife lived for nearly two decades. In addition to tending cattle, Borman continued his hobbies in rebuilding and modeling aircraft during these years. Following John Glenn's death in December 2016, Borman became the oldest living American astronaut. Borman gave the commencement address to the University of Arizona's 2008 graduating class. He is a member of the Society of Antique Modelers (SAM). Borman was one of ten Gemini astronauts inducted into the International Space Hall of Fame in 1982. He was also inducted into the National Aviation Hall of Fame in 1982; the U.S. Astronaut Hall of Fame in 1993; and the International Air & Space Hall of Fame in 1990. In the 1998 HBO miniseries From the Earth to the Moon, Borman was played by David Andrews. Borman was featured on Episode 655 of This American Life radio program titled The Not-So-Great Unknown, airing on August 24, 2018. His interview with David Kestenbaum in Act One of the episode titled So Over The Moon centered on his unconventional outlook towards space travel. I-80/I-94 in Lake County, Indiana, which runs through his birth town of Gary, Indiana, is named the Frank Borman Expressway. A K-8 school on Davis-Monthan Air Force Base in Tucson, Arizona is named in Borman's honor. A school in Phoenix, Arizona is named Frank Borman Elementary School. A school in Denton, Texas is named Borman Elementary School. ^ "What Borman Highway?". The Times. Munster, Indiana. July 10, 1969. p. 1 – via Newspapers.com. ^ a b c d e f g "Commanded Apollo 8, first mission to circumnavigate the Moon". New Mexico Museum of Space History. Retrieved December 24, 2017. ^ Borman, Frank (1988). Countdown. William Morrow. ISBN 0-688-07929-6. ^ a b "Frank Borman, Colonel, USAF". NASA. Retrieved January 31, 2018. ^ "Colonel Borman's flight experience". Archived from the original on September 11, 2014. ^ a b c "Frank Borman". NASA JSC. Retrieved June 25, 2016. ^ Williams, David R. (September 25, 2007). "The Apollo 8 Christmas Eve Broadcast". NASA National Space Science Data Center. 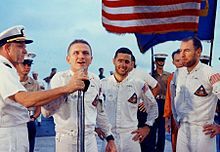 ^ a b Borman, Frank; Lovell, James; Anders, William (December 25, 1968). The Apollo 8 Christmas Eve Broadcast (MOV) (Live broadcast). NASA National Space Science Data Center. ^ Chaikin, Andrew (1999). A Man on the Moon. Time-Life, Inc. ISBN 978-0-7835-5675-8. ^ Rieker, Jane (May 6, 1974). "A Happy Landing for the Bormans". People. Retrieved January 31, 2018. ^ Diven, William (November 1992). "Auto dealers: sign of the times – The New Mexico Private 100". New Mexico Business Journal. Archived from the original on July 9, 2012. Retrieved February 21, 2012. ^ "A New Beginning". University Communications. University of Arizona. May 18, 2008. Retrieved June 25, 2016. ^ a b "The AMA History Program Presents: Biography of Col. FRANK BORMAN" (pdf). Academy of Model Aeronautics. July 2003. Retrieved June 25, 2016. ^ "Paine Selected as NASA Chief". The San Francisco Examiner. San Francisco, California. Associated Press. March 5, 1969. p. 6 – via Newspapers.com. ^ Posen, Bob (June 30, 1969). "Scholar-Athletes Urged to 'Do Their Thing'". St. Louis Post-Dispatch. St. Louis, Missouri. p. 52 – via Newspapers.com. ^ "Borman Wins Doolittle Award". The Naples Daily News. Naples, Florida. UPI. September 27, 1976. p. 2 – via Newspapers.com. ^ "Apollo 8 Wins Collier Trophy". Alabama Journal. Montgomery, Alabama. Associated Press. May 9, 1969. p. 18 – via Newspapers.com. ^ "Frank Borman". DeMolay International. ^ "National Aviation Hall of fame: Our Enshrinees". National Aviation Hall of Fame. Retrieved February 10, 2011. ^ "Frank Borman inducted into the U.S. Astronaut Hall of Fame". Retrieved June 25, 2016. ^ "When We Left Earth Full Cast and Crew". IMDb. Retrieved December 24, 2017. ^ "NASA Television Commemorates Apollo 8 Christmas Eve Broadcast". NASA. December 22, 2008. Retrieved January 31, 2018. ^ "American Experience, Race to the Moon, Full Cast and Crew". IMDb. Retrieved December 24, 2017. ^ "This American Life (#655) The Not-So-Great Unknown: Act One". This American Life. August 24, 2018. Retrieved August 27, 2018. ^ "655: The Not-So-Great Unknown – This American Life". This American Life. August 25, 2018. Archived from the original on August 27, 2018. Retrieved August 27, 2018. ^ Staff. "Frank Borman". Borman Expressway Reconstruction Project. Indiana Department of Transportation. Archived from the original on March 28, 2007. Retrieved March 18, 2007. ^ "Homepage". Borman K-8 Elementary School. Retrieved January 31, 2018. ^ "Homepage". Frank Borman School. Retrieved January 30, 2018. ^ "District Announcements & Info". www.dentonisd.org. Retrieved April 1, 2019. Borman, Frank; Serling, Robert J. (October 1988). Countdown: An Autobiography. Silver Arrow. ISBN 0-688-07929-6. Wikimedia Commons has media related to Frank Borman.